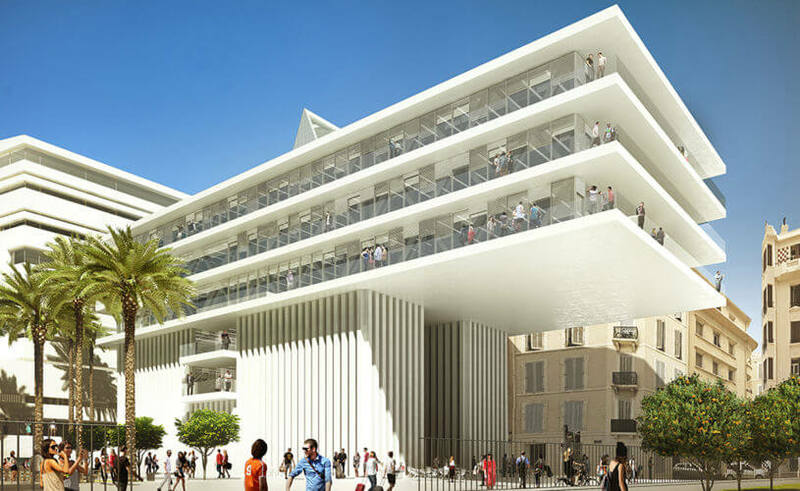 Currently under construction, KEDGE BS Toulon’s new campus will be ready to welcome its students next fall. Situated across the street from the train station and in the heart of the city’s cultural neighborhood, the new campus will be ideal for student living. A quick walk will take you to the Zenith Concert Hall, the Liberty Theater, the Opera, the Art Street, the Port, Beaches and the Mayol Rugby Stadium. The 4 acre remodeled neighborhood will soon host a new multimedia library, Toulon’s Art School, Start-Ups and the TVT business incubation and development services. Nestled in the historical Alexandre 1re garden, the School will benefit from a “Smart” and environmentally friendly infrastructure design by Corrine Vezzioni, 2015 woman architect of the year. This new campus is designed for experimentation and avant-garde teaching methods. Highly connected and equipped for digital learning, this campus is adapted for innovative pedagogy. Toulon is located in the heart of Provence. Halfway between Marseille and Nice, you can use your free time to visit St Tropez, the Azure Cost and hundreds of wineries. Home not only to the most beautiful harbour in europe, blue flag certified beaches and unspoilt coves, but also to cultural and high-level sporting facilities, Toulon enjoys a favourable geographic location which is 4 hours away from paris, 2.5 hours from the southern french alps, and 15 minutes from the beach. From concerts to ballet, theater to beach parties, Toulon offers a variety of cultural entertainment. If you feel like hitting the streets, do not forget to wander down the Art Street. Thanks to Toulon’s urban revival, more than 40 boutiques, designers, restaurants, wine bars and coffee shops await you. Another reason to love the South of France? Great weather allows us to organize festivals all throughout the year. Books, comics, films and music… make sure your do not miss the fashion, photography and design festivals organize by the Villa Noailles. This year’s newest culture hot spot, the Carmignac Foundation on the Porquerolles Island. Toulon is located in the heart of nearly 430km of coastline scattered with unspoilt coves, craggy calanques, beaches and islands. The Port Cros National Park, Europe’s oldest maritime park, provides visiters with the opportunity to discover the mediteraneans flore and fauna… and amazing beaches. In the near distance you can see the mountainous range of Sainte-Baume, l’Estérel and Maures, or even further away in the canyons of the Verdon Regional Natural Park. These diverse surfaces and landscapes are a paradise for sports lovers and outdoor enthusiasts: white water sports, sailing, surfing, kitesurfing, diving, climbing, mountain biking, and aerial or motor sports. And rugby of course, with the legendary Toulon Rugby Club.